“DHS” redirects here. For other uses, see DHS (disambiguation). A video released in 2016 by the DHS, detailing its duties and responsibilities. The mission of the Office will be to develop and coordinate the implementation of a comprehensive national strategy to secure the United States from terrorist threats or attacks. The Office will coordinate the executive branch’s efforts to detect, prepare for, prevent, protect against, respond to, and recover from terrorist attacks within the United States. Prior to the signing of the bill, controversy about its adoption centered on whether the Federal Bureau of Investigation and the Central Intelligence Agency should be incorporated in part or in whole (neither were included). The bill was also controversial for the presence of unrelated “riders“, as well as for eliminating certain union-friendly civil service and labor protections for department employees. Without these protections, employees could be expeditiously reassigned or dismissed on grounds of security, incompetence or insubordination, and DHS would not be required to notify their union representatives. Tom Ridge was named secretary on January 24, 2003, and began naming his chief deputies. DHS officially began operations on January 24, 2003, but most of the department’s component agencies were not transferred into the new Department until March 1. After establishing the basic structure of DHS and working to integrate its components and get the department functioning, Ridge announced his resignation on November 30, 2004, following the re-election of President Bush. Bush initially nominated former New York City Police Department commissioner Bernard Kerik as his successor, but on December 10, Kerik withdrew his nomination, citing personal reasons and saying it “would not be in the best interests” of the country for him to pursue the post. A federal appeals court ruled against DHS in 2006; pending a final resolution to the litigation, Congress’s fiscal year 2008 appropriations bill for DHS provided no funding for the proposed new personnel system. DHS announced in early 2007 that it was retooling its pay and performance system and retiring the name “MaxHR”. On November 16, 2018, President Trump signed into law the Cybersecurity and Infrastructure Security Agency Act of 2018, which elevated the mission of the former-DHS National Protection and Programs Directorate (NPPD) within DHS and established the Cybersecurity and Infrastructure Security Agency (CISA). Whereas the Department of Defense is charged with military actions abroad, the Department of Homeland Security works in the civilian sphere to protect the United States within, at, and outside its borders. Its stated goal is to prepare for, prevent, and respond to domestic emergencies, particularly terrorism. On March 1, 2003, DHS absorbed the U.S. Customs Service and Immigration and Naturalization Service (INS) and assumed its duties. In doing so, it divided the enforcement and services functions into two separate and new agencies: Immigration and Customs Enforcement and Citizenship and Immigration Services. The investigative divisions and intelligence gathering units of the INS and Customs Service were merged forming Homeland Security Investigations, the primary investigative arm of DHS. Additionally, the border enforcement functions of the INS, including the U.S. Border Patrol, the U.S. Customs Service, and the Animal and Plant Health Inspection Service were consolidated into a new agency under DHS: U.S. Customs and Border Protection. The Federal Protective Service falls under the National Protection and Programs Directorate. The Department of Homeland Security is headed by the Secretary of Homeland Security with the assistance of the Deputy Secretary. The department contains the components listed below. Federal Emergency Management Agency: agency that oversees the federal government’s response to natural disasters like earthquakes, hurricanes, tornadoes, floods, forest fires. Office of the Secretary includes the Privacy Office, Office for Civil Rights and Civil Liberties, Office of Inspector General, Citizenship and Immigration Services Ombudsman, Office of Legislative Affairs, Office of the General Counsel, Office of Public Affairs, Office of Counternarcotics Enforcement (CNE), Office of the Executive Secretariat (ESEC), and the Military Advisor’s Office. 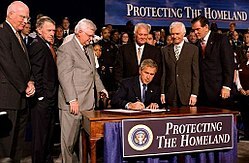 In an August 5, 2002 speech, President Bush said: “We are fighting … to secure freedom in the homeland.” Prior to the creation of DHS, U.S. Presidents had referred to the U.S. as “the nation” or “the republic” and to its internal policies as “domestic”. Also unprecedented was the use, from 2002, of the phrase “the homeland” by White House spokespeople. In 2011, the Department of Homeland Security phased out the old Homeland Security Advisory System, replacing it with a two-level National Terrorism Advisory System. The system has two types of advisories: Alerts and Bulletins. NTAS Bulletins permit the secretary to communicate critical terrorism information that, while not necessarily indicative of a specific threat against the United States, can reach homeland security partners or the public quickly, thereby allowing recipients to implement necessary protective measures. Alerts are issued when there is specific and credible information of a terrorist threat against the United States. Alerts themselves have two levels: Elevated and Imminent. An Elevated Alert is issued when there is credible information about an attack but only general information about timing or a target. An Imminent Alert is issued when the threat is very specific and impending in the very near term. 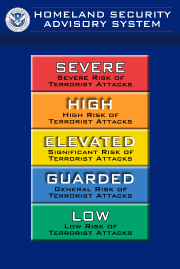 On March 12, 2002, the Homeland Security Advisory System, a color-coded terrorism risk advisory scale, was created as the result of a Presidential Directive to provide a “comprehensive and effective means to disseminate information regarding the risk of terrorist acts to Federal, State, and local authorities and to the American people.” Many procedures at government facilities are tied into the alert level; for example a facility may search all entering vehicles when the alert is above a certain level. Since January 2003, it has been administered in coordination with DHS; it has also been the target of frequent jokes and ridicule on the part of the administration’s detractors about its ineffectiveness. After resigning, Tom Ridge stated that he did not always agree with the threat level adjustments pushed by other government agencies. In January 2003, the office[clarification needed] was merged into the Department of Homeland Security and the White House Homeland Security Council, both of which were created by the Homeland Security Act of 2002. The Homeland Security Council, similar in nature to the National Security Council, retains a policy coordination and advisory role and is led by the Assistant to the President for Homeland Security. As of January 13, 2011, the DHS advised the American public of an ‘elevated national threat’ level, recommending that all Americans ‘should establish an emergency preparedness kit and emergency plan for themselves and their family, and stay informed about what to do during an emergency’. The seal is symbolic of the Department’s mission – to prevent attacks and protect Americans – on the land, in the sea and in the air. In the center of the seal, a graphically styled white American eagle appears in a circular blue field. The eagle’s outstretched wings break through an inner red ring into an outer white ring that contains the words “U.S. DEPARTMENT OF” in the top half and “HOMELAND SECURITY” in the bottom half in a circular placement. The eagle’s wings break through the inner circle into the outer ring to suggest that the Department of Homeland Security will break through traditional bureaucracy and perform government functions differently. In the tradition of the Great Seal of the United States, the eagle’s talon on the left holds an olive branch with 13 leaves and 13 seeds while the eagle’s talon on the right grasps 13 arrows. Centered on the eagle’s breast is a shield divided into three sections containing elements that represent the American homeland – air, land, and sea. The top element, a dark blue sky, contains 22 stars representing the original 22 entities that have come together to form the department. The left shield element contains white mountains behind a green plain underneath a light blue sky. The right shield element contains four wave shapes representing the oceans alternating light and dark blue separated by white lines. Since its inception, the department has had its temporary headquarters in Washington, D.C.’s Nebraska Avenue Complex, a former naval facility. The 38-acre (15 ha) site, across from American University, has 32 buildings comprising 566,000 square feet (52,600 m2) of administrative space. In early 2007, the department submitted a $4.1 billion plan to Congress to consolidate its 60-plus Washington-area offices into a single headquarters complex at the St. Elizabeths Hospital campus in Anacostia, Southeast Washington, D.C. The earliest DHS would begin moving to St. Elizabeths is 2012. The move is being championed by District of Columbia officials because of the positive economic impact it will have on historically depressed Anacostia. The move has been criticized by historic preservationists, who claim the revitalization plans will destroy dozens of historic buildings on the campus. Community activists have criticized the plans because the facility will remain walled off and have little interaction with the surrounding area. On January 8, 2009, the National Capital Planning Commission approved the Department of Homeland Security’s plans to move into the campus of St. Elizabeths Hospital. In February 2015 the General Services Administration said that the site would open in 2021. During a Senate Homeland Security and Governmental Affairs Committee hearing on the reauthorization of DHS, Elaine Duke, deputy secretary of DHS, said there is a weariness and anxiety within DHS about the repeated congressional efforts to agree to a long-term spending plan, which has resulted in several threats to shutdown the federal government. “Shutdowns are disruptive,” Duke said. She said the “repeated failure on a longtime spending plan resulting in short-term continuing resolutions (CRs) has caused “angst” among the department’s 240,000 employees in the weeks leading up to the CRs.” The uncertainty about funding hampers DHS’s ability to pursue major projects and it takes away attention and manpower from important priorities. Seventy percent of DHS employees are considered essential and are not furloughed during government shutdowns. Soon after the formation of Department of Homeland Security, the department worked with the Ad Council to launch the Ready Campaign, a national public service advertising (PSA) campaign to educate and empower Americans to prepare for and respond to emergencies including natural and man-made disasters. With pro bono creative support from the Martin Agency of Richmond, Virginia, the campaign website “Ready.gov” and materials were conceived in March 2002 and launched in February 2003, just before the launch of the Iraq War. One of the first announcements that garnered widespread public attention to this campaign was one by Tom Ridge in which he stated that in the case of a chemical attack, citizens should use duct tape and plastic sheeting to build a homemade bunker, or “sheltering in place” to protect themselves. As a result, the sales of duct tape skyrocketed and DHS was criticized for being too alarmist. The DHS National Cyber Security Division (NCSD) is responsible for the response system, risk management program, and requirements for cyber-security in the U.S. The division is home to US-CERT operations and the National Cyber Alert System. The DHS Science and Technology Directorate helps government and private end-users transition to new cyber-security capabilities. This directorate also funds the Cyber Security Research and Development Center, which identifies and prioritizes research and development for NCSD. The center works on the Internet’s routing infrastructure (the SPRI program) and Domain Name System (DNSSEC), identity theft and other online criminal activity (ITTC), Internet traffic and networks research (PREDICT datasets and the DETER testbed), Department of Defense and HSARPA exercises (Livewire and Determined Promise), and wireless security in cooperation with Canada. In January 2017, DHS officially designated state-run election systems as critical infrastructure. The designation made it easier for state and local election officials to get cybersecurity help from the federal government. In October 2017, DHS convened a Government Coordinating Council (GCC) for the Election Infrastructure Subsection with representatives from various state and federal agencies such as the Election Assistance Commission and National Association of Secretaries of State. DHS Annual Financial Report for financial year 2010 showed a net cost of operations of $56.4 billion (FY 2009, restated: $49.9 billion), out of total budgetary resources of $83.2 billion (FY 2009, restated: $85.2 billion). The components with the highest net cost were US Coast Guard ($12.1 billion), U.S. Customs and Border Protection ($11.6 billion), and Federal Emergency Management Agency ($10.5 billion). Revenues of $10.4 billion were generated in the year (FY 2009, restated: $9.8 billion). The Department of Homeland Security has been dogged by persistent criticism over excessive bureaucracy, waste, ineffectiveness and lack of transparency. Congress estimates that the department has wasted roughly $15 billion in failed contracts (as of September 2008[update]). In 2003, the department came under fire after the media revealed that Laura Callahan, Deputy Chief Information Officer at DHS with responsibilities for sensitive national security databases, had obtained her bachelor, masters, and doctorate computer science degrees through Hamilton University, a diploma mill in a small town in Wyoming. The department was blamed for up to $2 billion of waste and fraud after audits by the Government Accountability Office revealed widespread misuse of government credit cards by DHS employees, with purchases including beer brewing kits, $70,000 of plastic dog booties that were later deemed unusable, boats purchased at double the retail price (many of which later could not be found), and iPods ostensibly for use in “data storage”. The Associated Press reported on September 5, 2007, that DHS had scrapped an anti-terrorism data mining tool called ADVISE (Analysis, Dissemination, Visualization, Insight and Semantic Enhancement) after the agency’s internal Inspector General found that pilot testing of the system had been performed using data on real people without required privacy safeguards in place. The system, in development at Lawrence Livermore and Pacific Northwest National Laboratory since 2003, has cost the agency $42 million to date. Controversy over the program is not new; in March 2007, the Government Accountability Office stated that “the ADVISE tool could misidentify or erroneously associate an individual with undesirable activity such as fraud, crime or terrorism.” Homeland Security’s Inspector General later said that ADVISE was poorly planned, time-consuming for analysts to use, and lacked adequate justifications. Fusion centers are terrorism prevention and response centers, many of which were created under a joint project between the Department of Homeland Security and the US Department of Justice‘s Office of Justice Programs between 2003 and 2007. The fusion centers gather information not only from government sources, but also from their partners in the private sector. They are designed to promote information sharing at the federal level between agencies such as the Central Intelligence Agency (CIA), Federal Bureau of Investigation (FBI), Department of Justice, US Military and state and local level government. As of July 2009[update], the Department of Homeland Security recognized at least seventy-two fusion centers. Fusion centers may also be affiliated with an Emergency Operations Center that responds in the event of a disaster. In 2009, the Virginia Fusion Center came under criticism for publishing a terrorism threat assessment which stated that certain universities are potential hubs for terror related activity. The report targeted historically black colleges and identified hacktivism as a form of terrorism. All mail originating outside the United States Customs territory that is to be delivered inside the U.S. Customs territory is subject to Customs examination,” says the CBP Web site. That includes personal correspondence. “All mail means ‘all mail,'” said John Mohan, a CBP spokesman, emphasizing the point. DHS is the only large federal agency to score below 50% in overall survey rankings. It was last of large federal agencies in 2014 with 44.0% and fell even lower in 2015 at 43.1%, again last place. In the Center for Effective Government analysis of 15 federal agencies which receive the most Freedom of Information Act FOIA requests, published in 2015 (using 2012 and 2013 data), the Department of Homeland Security earned a D by scoring 69 out of a possible 100 points, i.e. did not earn a satisfactory overall grade. It also had not updated its FOIA policies since the 2007 FOIA amendments. We Must Secure The Border And Build The Wall To Make America Safe Again. Although dismissed by the DHS as a coincidence, both the use of “88” in a document, and the similarity to the slogan’s phrasing (“We must secure the existence of our people and a future for white children”), drew criticism and controversy from several media outlets. Interior ministry. Generally in other countries “interior ministries” usually deal with internal police, immigration and border control duties. ^ “Secretary of Homeland Security”. Homeland Security. January 25, 2017. ^ a b “Budget In Brief: Fiscal Year 2017” (PDF). Homeland Security. pp. 1, 2. Retrieved March 23, 2017. ^ “Our Mission”. Homeland Security. ^ “About DHS”. Homeland Security. June 29, 2016. ^ “Department of Homeland Security Secretary Kirstjen Nielsen will be leaving administration, Trump says”. ABC News. April 7, 2019. Retrieved April 7, 2019. ^ Faulders, Katherine (April 8, 2019). “Department of Homeland Security Secretary Kirstjen Nielsen resigns”. ABC News. Retrieved April 10, 2019. ^ “Trump’s possibly illegal designation of a new acting homeland security secretary, explained”. [Vox News]]. April 8, 2019. Retrieved April 8, 2019. ^ “DHS Secretary Kirstjen Nielsen resigns after clashes with Trump on immigration”. CBS News. April 7, 2019. Retrieved April 8, 2019. ^ Gerstein, Josh; Beasley, Stephanie. “Legality of Trump move to replace Nielsen questioned”. POLITICO. Retrieved April 10, 2019. ^ Feuerherd, Ben (April 10, 2019). “Acting deputy DHS secretary was forced to resign after Nielsen exit”. New York Post. Retrieved April 10, 2019. ^ a b c d e “National Strategy For Homeland Security” (PDF). DHS. Archived from the original (PDF) on November 14, 2007. Retrieved October 31, 2007. ^ [Peter Andreas: Redrawing the line 2003:92], additional text. ^ Perl, Raphael (2004).”The Department of Homeland Security: Background and Challenges”, Terrorism—reducing Vulnerabilities and Improving Responses, Committee on Counterterrorism Challenges for Russia and the United States, Office for Central Europe and Eurasia Development, Security, and Cooperation Policy and Global Affairs, in Cooperation with the Russian Academy of Sciences, page 176. National Academies Press. ISBN 0-309-08971-9. ^ “History: Who Became Part of the Department?” United States Department of Homeland Security website Archived July 12, 2012, at the Wayback Machine. Retrieved on August 22, 2008. ^ Chomsky, Noam (2005). Imperial Ambitions, page 199. Metropolitan Books. ISBN 0-8050-7967-X. ^ a b c d e Stephen Barr. “DHS Withdraws Bid to Curb Union Rights”, The Washington Post page D01, February 20, 2008. Retrieved on August 20, 2008. ^ “Cybersecurity and Infrastructure Security Agency”. DHS.gov. Retrieved November 24, 2018. ^ “Our Leadership | FLETC”. www.fletc.gov. Retrieved December 26, 2016. ^ “Richard “Rich” M. Chávez | Homeland Security”. Homeland Security. Retrieved December 26, 2016. ^ “U. S. Coast Guard Senior Leadership”. www.uscg.mil. Retrieved December 26, 2016. ^ “Commissioner R. Gil Kerlikowske | U.S. Customs and Border Protection”. www.cbp.gov. Retrieved December 26, 2016. ^ “Leadership”. www.secretservice.gov. Retrieved May 12, 2017. ^ The United States Coast Guard has both military and law enforcement functions. Title 14 of the United States Code provides that “The Coast Guard as established January 28, 1915, shall be a military service and a branch of the armed forces of the United States at all times.” Coast Guard units, or ships of its predecessor service, the Revenue Cutter Service, have seen combat in every war and armed conflict of the United States since 1790, including the Iraq War. ^ Bovard, James. “Moral high ground not won on battlefield”, USA Today, October 8, 2008. Retrieved on August 19, 2008. ^ a b Wolf, Naomi (2007). The End of America, page 27. Chelsea Green Publishing. ISBN 978-1-933392-79-0. ^ “Remarks by Governor Ridge Announcing Homeland Security Advisory System”. Retrieved May 5, 2017. ^ “Copy of press release 0046”. US Department of Defense. Retrieved January 13, 2011. ^ “Fact Sheet: Department of Homeland Security Seal”, DHS press release, June 19, 2003. DHS website Archived October 24, 2006, at the Wayback Machine. Retrieved on August 26, 2008. ^ “Statement of Secretary Tom Ridge”. DHS. Retrieved October 31, 2007. ^ Losey, Stephen (March 19, 2007). “Homeland Security plans move to hospital compound”. Federal Times. Archived from the original on January 2, 2013. Retrieved October 31, 2007. ^ “Most Endangered Places”. 2/2009. National Trust. Retrieved February 4, 2009. ^ Holley, Joel (June 17, 2007). “Tussle Over St. Elizabeths”. The Washington Post. p. C01. Retrieved October 31, 2007. ^ “NCPC Approves Final Master Plan for DHS Headquarters at St. Elizabeths”. Archived from the original on January 17, 2009. ^ a b Roberts, Ed (February 7, 2018). 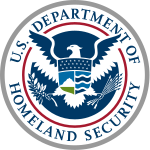 “Spending stalemate has costs at Department of Homeland Security – Homeland Preparedness News”. Homeland Preparedness News. Retrieved February 27, 2018. ^ Forbes, Daniel (May 28, 2004). “$226 Million in Govt Ads Helped Pave the Way for War”. Antiwar.com. Retrieved October 31, 2007. “Homeland Security: Ready.Gov”. Outdoor Advertising Association of America. Archived from the original on October 17, 2007. Retrieved October 31, 2007. ^ “CNN Live at daybreak”. Aired February 20, 2003. CNN. Retrieved October 31, 2007. ^ “Homeland Security Frequently Asked Questions”. ready.gov. Archived from the original on November 6, 2007. Retrieved October 31, 2007. ^ “Clean Air”. ready.gov. Archived from the original on October 17, 2007. Retrieved October 31, 2007. ^ “Are You Ready.gov?”. February 21, 2003. lies.com. Retrieved October 31, 2007. ^ “Build A Kit | Ready.gov”. www.ready.gov. Retrieved October 31, 2016. ^ “Make A Plan | Ready.gov”. www.ready.gov. Retrieved October 31, 2016. ^ “About the Ready Campaign | Ready.gov”. www.ready.gov. Retrieved October 31, 2016. ^ “Emergency Preparedness”. AdCouncil. Retrieved October 31, 2016. ^ Newswire, MultiVu – PR. “FEMA, Ad Council Launch New PSA Focused on People with Disabilities Preparing for Emergencies”. Multivu. Retrieved October 31, 2016. ^ “Individuals with Disabilities and Others with Access and Functional Needs | Ready.gov”. ready.gov. Retrieved October 31, 2016. ^ “Surge Capacity Force – Homeland Security”. Retrieved April 18, 2019. ^ “National Cyber Security Division”. U.S. Department of Homeland Security. Retrieved June 14, 2008. ^ a b “FAQ: Cyber Security R&D Center”. U.S. Department of Homeland Security S&T Directorate. Retrieved June 14, 2008. ^ “Ongoing Research and Development”. U.S. Department of Homeland Security S&T Directorate. Retrieved June 14, 2008. ^ AFP-JiJi, “U.S. boots up cybersecurity center”, October 31, 2009. ^ Murtha, Alex (October 17, 2017). “DHS, partners convene for government council on protecting election infrastructure”. Homeland Preparedness News. Retrieved December 20, 2017. ^ “United States Federal Budget for Fiscal Year 2010 (vid. p.72)” (PDF). Government Printing Office. Archived from the original (PDF) on February 5, 2011. Retrieved January 9, 2010. ^ a b c “US Department of Homeland Security Annual Financial Report FY 2010 (vid. pp.37,38,41)” (PDF). Retrieved January 13, 2011. ^ a b “US Department of Homeland Security Annual Financial Report FY 2010 (vid. pp.147 ff. )” (PDF). US Department of Homeland Security. Retrieved January 13, 2011. ^ “US Department of Homeland Security Annual Financial Report FY 2009 (vid. p.134)” (PDF). US Department of Homeland Security. Retrieved January 13, 2011. ^ “US Department of Homeland Security Annual Financial Report FY 2008 (vid. p.44)” (PDF). US Department of Homeland Security. Retrieved January 13, 2011. ^ “US Department of Homeland Security Annual Financial Report FY 2007 (vid. p.50)” (PDF). US Department of Homeland Security. Retrieved January 13, 2011. ^ “US Department of Homeland Security Annual Financial Report FY 2005 (vid. p.294)” (PDF). US Department of Homeland Security. Retrieved January 13, 2011. ^ “US Department of Homeland Security Annual Financial Report FY 2003 (vid. p.40)” (PDF). US Department of Homeland Security. Retrieved January 13, 2011. ^ “US Department of Homeland Security Annual Financial Report FY 2006, FY 2004 (404 error)”. US Department of Homeland Security. Retrieved January 13, 2011. ^ a b “US Department of Homeland Security Annual Financial Report FY 2010 (vid. pp.33 ff. )” (PDF). US Department of Homeland Security. Retrieved January 13, 2011. ^ “US Department of Homeland Security Annual Financial Report FY 2010 (vid. pp.4 f.)” (PDF). US Department of Homeland Security. Retrieved January 13, 2011. ^ Hedgpeth, Dana (September 17, 2008). “Congress Says DHS Oversaw $15 Billion in Failed Contracts”. The Washington Post. Retrieved November 17, 2008. ^ Lipton, Eric (July 19, 2006). “Homeland Security Department Is Accused of Credit Card Misuse”. The New York Times. Retrieved October 31, 2007. ^ Jakes Jordan, Lara (July 19, 2006). “Credit Card Fraud at DHS”. Homeland Security Weekly. Archived from the original on October 17, 2007. Retrieved October 31, 2007. ^ “Government’s Katrina credit cards criticized”. Associated Press. September 15, 2005. Retrieved October 31, 2007. ^ Hedgpeth, Dana (September 17, 2008). “Congress says DHS oversaw $15 billion in failed contracts”. The Washington Post. Retrieved September 17, 2008. ^ McCarthy, Kieren (November 20, 2015). “Who’s running dozens of top-secret unpatched databases? The Dept of Homeland Security”. The Register. Retrieved January 3, 2016. ^ “ADVISE Could Support Intelligence Analysis More Effectively” (PDF). pdf file. DHS. Retrieved October 31, 2007. ^ Singel, Ryan (March 20, 2007). “Homeland Data Tool Needs Privacy Help, Report Says”. Wired. Retrieved October 31, 2007. ^ Sniffen, Michael J. (September 5, 2007). “DHS Ends Criticized Data-Mining Program”. The Washington Post. Associated Press. Retrieved October 31, 2007. ^ Monahan, T. 2009. The Murky World of ‘Fusion Centres’. Criminal Justice Matters 75 (1): 20-21. ^ Monahan, T. and Palmer, N.A. 2009. The Emerging Politics of DHS Fusion Centers. Security Dialogue 40 (6): 617-636. ^ “‘Fusion Centers’ Expand Criteria to Identify Militia Members”. Fox News. March 23, 2009. Archived from the original on August 3, 2009. Retrieved December 19, 2018. ^ “The Raw Story – Fusion center declares nation’s oldest universities possible terror threat”. Retrieved April 18, 2019. 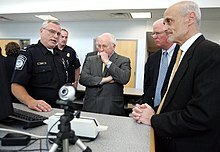 “Homeland Security employees rank last in job satisfaction survey”. ABC Inc., WLS-TV Chicago. February 8, 2007. Retrieved October 31, 2007. ^ Conroy, Bill (January 31, 2007). “DHS memo reveals agency personnel are treated like “human capital““. Narco News. Archived from the original on October 17, 2007. Retrieved October 31, 2007. ^ “Best Places to Work Agency Rankings”. Partnership for Public Service. ^ “Did Trump administration send a coded signal to neo-Nazis? Maybe not — but is that reassuring?”. Salon (website). July 6, 2018. ^ “We Must Secure The Border And Build The Wall To Make America Safe Again”. DHS. February 15, 2018. ^ “Homeland Security Officials Say Claims That Statement Mimics A White Supremacist Slogan Are Merely Conspiracy Theories”. BuzzFeed. June 29, 2018. ^ “Are ’14’ And ’88’ Nazi Dog Whistles In Border Security Document — Or Just Numbers?”. The Forward. June 28, 2018. “DHS Organizational Chart” (PDF). (144 KB) – from March 20, 2008.